What is a dart? In the UK it is a pub game fueled by several pints of the players’ favorite brew. To tailors, though, it is a technique for removing the fullness in a pattern in areas such as hips, waist and bust. Sewing darts allows the tailor to shape a garment to the natural curve of the body. Without darts, clothing would be quite boxy, as in man-tailored shirts. While you can certainly add shape by sewing curves, this is really only possible in side seams. Most darts begin at the seamline and point across, up or down toward the center of the garment. Some darts, such as those on fitted dresses without a waistline will have a long dart starting near the shoulder blade, nip in at the waist and then gently flare out over the hips. Your pattern will have dart markings that resemble a series of dots in a pie-shaped wedge. If you have a dart on one side of your pattern, say the left hip, you will always have a corresponding dart on the right. This means that you will mark two layers of fabric, for instance, the right and left front bodice pieces. You will sew a tailor tack, that is, a strand of thread looped twice, through each dot, and through the two layers of fabric. You will cut the loops on the front and back of the dart markings to allow you to gently pull the two pattern pieces apart. Then, clip the thread between the pattern pieces to separate them, keeping the thread marking the dart in place. Try not to jerk the pieces apart or the strands of thread will come loose and you will have to mark the darts again. To begin, sewing one dart at a time, fold one piece of fabric with the right sides together along dart line, matching the dots. You will have a pinch of fabric, wider at one end and disappearing into a point at the other. Place pins horizontally across the seamline from top to bottom every two inches or so, closer if you are new to the technique. Begin sewing at the top of the dart, back stitching the first few stitches to hold them in place. 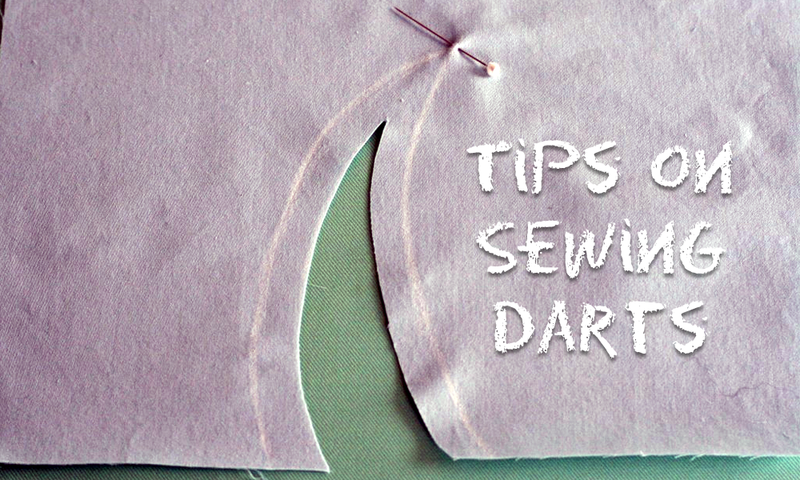 Sewing slowing, create a seam from the top or widest point of the dart to the end or narrowest point. Keep sewing until you are off the edge of the fabric. Here is an important tip for a smooth end to your dart. Gradually narrow the seam rather than have an abrupt change in width. You want the point of the dart to sort of disappear into infinity. Clip the thread and knot it tightly against the tip of the dart. If the dart is wide, clip it open as far as convenient. Leave narrow darts unclipped. Press open wide darts, but press narrow darts toward the center of the garment, or downward in the case of bust darts. Repeat with each dart in your pattern.